Surely Jason Dufner was honored, initially, when he was selected to play in Tiger Woods’ charity event this weekend, the Northwestern Mutual World Challenge. It’s an 18-man invitational with only players from the top 30. But he’s made such a stink about not being able to watch his beloved Auburn Tigers, who play on Saturday, that he may have gotten what he deserved. On Monday, the Duf Daddy tweeted to Tiger, asking that he reschedule the tournament to run Thursday and Friday with 36 holes each day. That would leave Saturday open for Dufner to watch the SEC Championship Game. "Petition denied," came the surprisingly swift reply from Woods. Later that night, Dufner reached out to John Daly, who once had a TV installed in his golf bag. Woods, it appears, had enough of Dufner making a mockery of his tournament. Whether or not Woods himself is in charge of doling out the courtesy cars for players at his event, we don’t know. But Dufner thought it was suspicious that he was the only one to receive a redish-maroon car. Is that Stanford red to show that Woods’ alma mater is also playing this weekend, in the Pac-12 title game? We think it is. And we think that’s awesome. Or it could just be a red car to make sure Dufner has to drive around in the host’s favorite color. Either way, well played Mr. Woods. Because he tweets about Auburn like it’s his second job and he’s been invited to give a few inspirational talks to the team, Dufner was invited onto "This Week in the SEC" on the CBS Sports Network a few weeks ago. On Wednesday, he was a guest on the "Dan Patrick Show." In the interview, Patrick easily covered Dufner’s three favorite subjects: golf, Amanda and Auburn. And when Dufner mentioned that his wife is an Alabama alum, Patrick was sure Jason gloated around Amanda like any proud Tigers fan would after Auburn’s surprising comeback win on Saturday. Maybe a lesser man would have, but Dufner did not. "I had to watch myself because my wife’s an Alabama grad and she happened to be sitting right next to me (at the game)," he said. "So it wasn’t too crazy. I didn’t want to get smacked around." "We’re both pretty good sports about it. I play sports so she understands sports more than the average fan, being inside the ropes with me. And crazy things happen in sports. It’s been hard for me the last couple years with (Alabama) claiming the national championship, and she’s been a pretty good sport about it. So I didn’t want to rub it in too much." Patrick pressed further, telling Dufner that he was allowed to because the game was in Auburn. "I know but I got to live with her the other 364 days of the year," Dufner said. He’s a smart man. So apparently Dufner’s love for Auburn does have some boundaries. 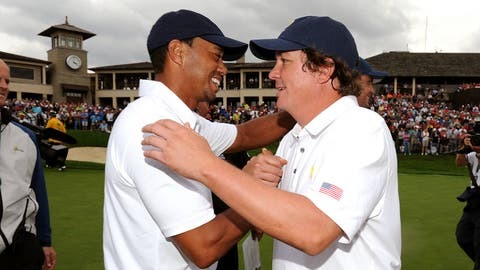 We were beginning to wonder when Dufner petitioned Tiger Woods to alter the schedule this weekend at the tournament Woods is hosting, so Dufner could watch Auburn in the SEC Championship Game. Dufner even told Patrick he briefly considered withdrawing so he could attend the football game. But Amanda talked him out of it. "I kind of petitioned with my wife last Sunday, ‘You think maybe I should withdrawal? Maybe go to this SEC Championship Game?’ She’s like, ‘Nope, you’ve had five weeks off, you need to go back out and make some money."